SHE had answered a call for volunteers but ended up doing the lion's share of the work. When Tamblyn Williams moved to South Africa to study wildlife, she couldn't have imagined how close she would become to her subject. The 23-year-old from Caringbah was enlisted to take over the care of two lion cubs named Jagger and Adam after they were abandoned by their mother, who had been part of a breeding program. Ms Williams said she quickly settled into a routine, mixing formula and bottle-feeding them before eventually moving them on to solid food. She also monitored the youngsters as they met their developmental milestones, playing with them and taking them for daily walks. But her bond with the lions will be temporary: Their instincts mean she will not have the same access to them in the future. "As they grow older I will have to stop interacting with them as they are too strong to play with," she said. The separation from Ms Williams hasn't been easy for Jagger. 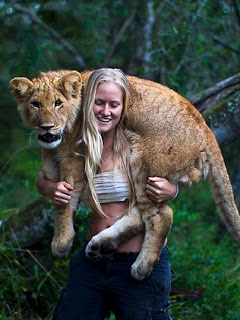 The photograph of him sitting on her shoulders was taken when the cub was six months old. "Jagger is very unique in his personality and is quite mischievous and very playful. He is very loving and makes lots of cries for attention when I'm around," she said.